The H.O. Studley Tool Chest is considered by many to be THE “Iconic Tool Chest,” the very tool chest that all others are compared to, and the envy of every woodworker who set their eyes upon it. On the outside it’s constructed of a gorgeous Cuban Mahogany, but it’s the meticulousness of the organization on the inside that sets it apart from everything. When opened, it reveals the breathtaking layout and arrangement of the 240+ tools contained within. All of which add to the beauty and awe-inspiring effect the tool chest has on those who’ve seen it. But who was H.O. Studley? Truthfully, we know more about the chest than the man who built it. And what about the lesser known Studley workbench? Have you ever seen it up close or even knew it existed (“Chortle”-level Patrons of Matt’s Basement Workshop will get a look at it in the bonus footage accompanying this video, join today by clicking here?) Those, and many more questions were what Don Williams set out to answer in his upcoming book about H.O. Studley and his tool chest, due out in early 2015. Don, along with photographer Narayan Nayar, and Christopher Schwarz of Lost Art Press are painstakingly documenting the man, his tools, and of course his tool chest, so the rest of us can understand who he was and what’s so amazing about this iconic piece of woodworking history. Along the journey to write the book and document the tool chest, Don made arrangements with the current owner to set up an exhibit for the general public to come in and see it up close. The H.O. 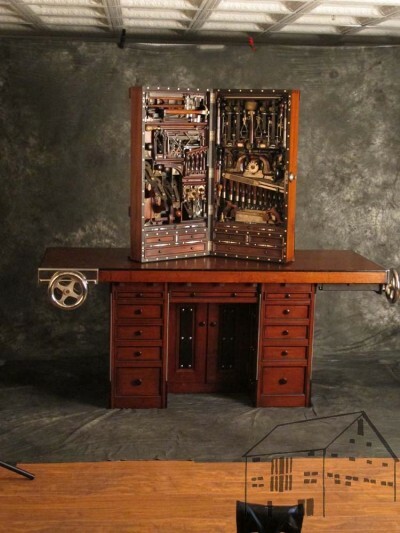 Studley Tool Chest and Workbench Exhibit is happening May 15-17, 2015 in Cedar Rapids, Iowa. It’s occurring the same weekend as Handworks in nearby Amana, Iowa and will be offering visitors a full 360º view of the tool chest and workbench. Tickets are currently on sale, but there is a limited number available. So don’t miss out on the opportunity to see the Studley Tool Chest in person. For more information visit www.studleytoolchest.com. Get your weightlifting belts on men. Time to move the display! Does the venue have to insure they have a floor supported enough to take the weight? Fifty people and that group of tools and cabinetry? I hope the show is on a six inch concrete slab directly over bedrock.